Relax in the back yard which features an in-ground pool (heating available), new hot tub, and a covered patio with comfortable seating. A grill is available. Landscaping includes an orange tree which you can pick in season. The back yard overlooks the second hole of the Desert Mirage Golf Course. The eat-in kitchen is fully equipped. The combination dining and living room area is bright and spacious with comfortable leather seating. A gas fireplace will warm you, if the evening is cool, while you are entertained by the stereo system or Dish TV which includes Encore movie package and DVD . The split floor plan features three bedrooms. The master has a king size bed and includes a master bath, separate entrance, and walk- in closet. The other two bedrooms (queen and twin beds) share a bathroom. The master and queen bedrooms include a TV/DVD combo. Phoenix metro area has approximately 16 baseball teams that start their Spring Training in mid-February through March. The closest baseball complex, located two miles from the house, is home to the Chicago White Sox and LA Dodgers. Spring baseball in the Phoenix area is great fun for the family! The City of Glendale is the 'antique capital' of the area. Glendale is very active in promoting special events, ie., the Home and Garden Show, Gun Show, and Monster Trucks. The Flagstaff and Tucson areas, only a couple hours drive away, offer their own attractions. The master bath has an outside entrance. It's handy when you're wet from the pool or hot tub. New shower enclosure, 4/16. Each bathroom is equipped with a hair dryer and basic toiletries. Towels and beach towels are provided. Double set of linens, extra pillows and blankets for each bed. Drip Coffeepot, espresso maker, press pot and coffee grinder available. 8 piece place setting, glassware includes red and white wine glasses and margarita glasses. Stereo system in living area. Set of foam blocks, children's books, and trucks and cars. A safety gate, booster chair and stroller is also available for use. Pool toys include floats for children. Pick oranges in season. Rosemary plant outside will provide fresh herbs for cooking. Golf course is right next door. Includes a lighted driving range. Two sets of clubs are available for renters use. There is gated parking for a recreational vehicle. Pool volleyball, ping pong and pool toys available. Floats available for children and adults. Back yard area completely fenced in. We enjoyed our time at this home in Glendale. It was conveniently located off of the 101 and was near the stadium, shopping and food options. The home easily fit 6 adults (however, one of the rooms had twin beds which weren't the most comfortable). Everything was clean and well stocked. The pool and hot tub were a great addition. We will definitely stay here again on our next trip to Pheonix. We spent a month in this wonderful house. It had everything we could need and more. Great pool and hot tub. Excellent location and great value for money. Thanks for your kind words. We're glad our home could be a part of your vacation stay in Glendale. Phenomenal! The accommodations were great. House was immaculate. The kitchen was very user friendly. Even had a juicer! There was a lemon/lime tree in the backyard. The pool and hot tub were well maintained. Although we did not have young children with us, there were toys available for toddlers and young children. It was within walking distance of Westgate Shopping Mall, Cabellas, and Tanger Outlets. There are a variety of activities that occur at Westgate. Yet, it was very quiet. We can't think of anything we did not like! This has been our second stay at this wonderful home. We had such a great vacation and will miss being there next year but hope to come back when our Canadian dollar improves. As we don't enjoy baseball and hockey games, we spent most of our time in the backyard swimming in the pool, relaxing in the hot tub, and golfing at the Desert Mirage. The Westgate is a 15 minute walk and we enjoyed going there once in awhile. The owners are really nice and Carolyn, the manager, is so great to work with and looked after everything for us. Looking forward to going back one day! We felt so comfortable in this immaculate house. Open, warm and inviting. The patio and back yard are a dream, overlooking the golf course, yet one has a feeling of privacy. 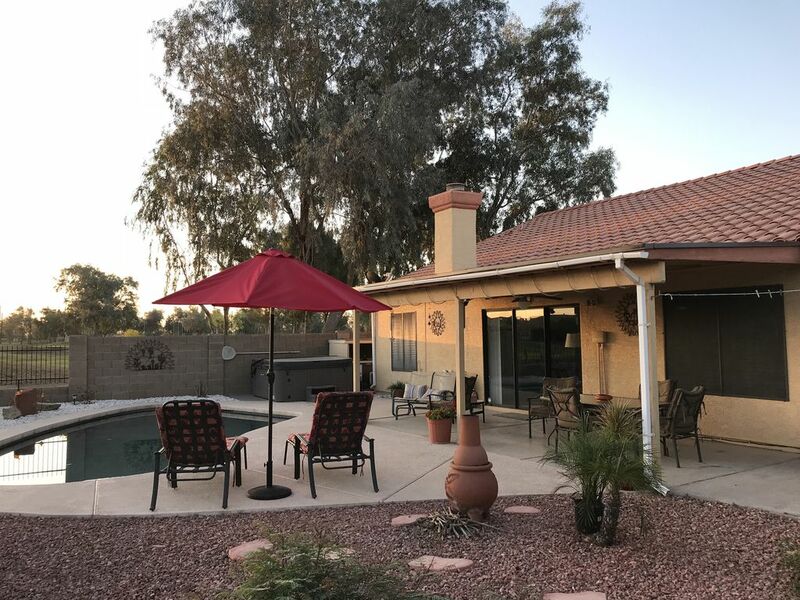 The location is a dream, so convenient and close to many venue's; however, the home is located on a cul de sac, so the ambience is quiet and peaceful. Arrived for the Christmas season to spend with family. This home was just what we needed and exceeded every expectation I could have had! Comfortable, clean, spacious, and accommodating in every way. Pool was heated daily for a small extra fee. All in all - when I return to Arizona, this will be my go-to spot without question! Westgate Entertainment Complex is within walking distance (about 3 blocks) from our home. This complex features shops, a brew house, restaurants, a 20 screen AMC Theatre, and the Gila River Arena or NHL Coyote's Hockey and/or other scheduled entertainment. This also features a dancing waters show. Tanger Outlet, with 85 stores, is located next to Westgate and shuttle service between the two complexes is available. Opposite Westgate is the Arizona Cardinal's Football Stadium. Cabela's is also close by. Downtown Glendale is a 15 minute drive from the house and is the Antique Capitol of the area. Antique stores, a candy company and other shops makes downtown Glendale a fun excursion. Golf: The Phoenix area is a golfer's paradise. From the home's back patio/pool area, you can watch golfers on the second hole of Desert Mirage Golf Club. Or you can be out there yourself. The golf club also features a driving range. This very inexpensive course is about 2 city blocks walking distance from your front door.